It's pumpkin time, isn't it? Halloween is just celebrated, now it's Thanksgiving time. Americans will give their thanks, by eating lots and lots next thursday. Among the dishes, will be a pumpkin pie, as usual. But they won't eat pumpkin ravioli. They won't, but we had it the other day. Not made by me, no no, I'm not that patient. Visiting a famous ravioli and pasta shop some time ago, which is Piemonte in Little Italy, it was impossible not to buy pumpkin-ricotta ravioli. It was an exciting buy, I must say. But then, I had to find a sauce for that. It was the easiest part. I typed 'pumpkin ravioli' and googled. Recipes started pouring from the screen, screaming, try me, try me! I didn't want a heavy sauce, that I knew. One of the recipes were standing there, silently, with an elegant smile. 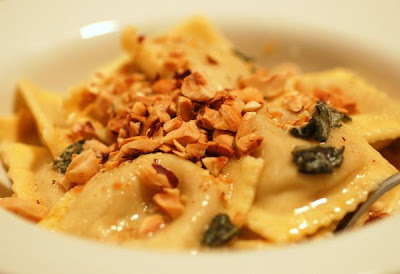 I chose that, from the food network: Pumpkin Ravioli with Sage and Roasted Hazelnuts. I didn't apply the recipe exactly, since I had my pumpkin ravioli already. I found the butter too much, and I didn't have parmesan at home. So I used 1/8th of a stick (approx. 1 tablespoon), I roasted the hazelnuts, I added 6-7 sage leaves to the butter. I had great Asiago cheese, from Buon Italy at Chelsea Market. So I grated some to go with another Italian delicacy. So happened this dish. We liked it. I think this simple sauce can be applied to pasta as well and as a Mediterranean by soul, I should have used olive oil instead. I love the recipes that arrive as a bonus. So simple, so unforgettable, so appetizing, so unexpected. 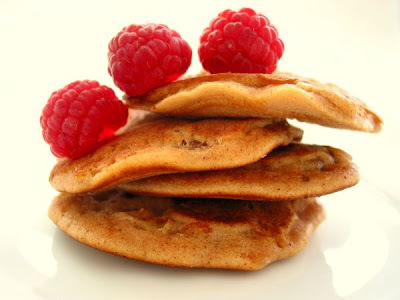 I love recipes that are created through a question: "What if?" What if I make a pasta sauce with the roasted peppers, that are sitting on the counter? Was my question. It was fall and I was buying kilos of red, sweet peppers each time I go to the farmers' market. I love them roasted. A wonderful addition to already colorful fall breakfasts; with some olive oil, homemade vinegar, sea salt, garlic and thyme (fresh or dried). That time, one of those gorgeous days in Antalya, I washed the peppers, roasted them (in the oven, around 200 -400 Fahrenheit- degrees for about half hour) and left on the counter so that they could cool a bit. I was in a mood for pasta. I looked at the roasted peppers, they looked at me. I said, what if I turn part of these peppers into a sauce. It could be like a basic tomato sauce, with slight differences. I could use heavy cream, if I had some. I only had some labaneh ('labne' in Turkish, a lighter version of cream cheese). The decision is made: Some of the roasted peppers are peeled, cleaned and put in a blender. 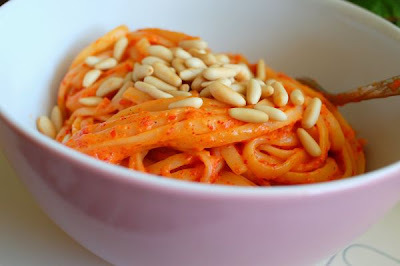 The pasta is cooked, then garlic is sauteed in a bit of olive oil, then the roasted pepper puree is added, then some labaneh, a little sea salt and freshly ground black pepper. Then they became 'one'; pasta, cheese, garlic, peppers. Then I ate a bowl full, with some roasted pinenuts. I loved it so much. I had another bowl. I felt guilty. Oh yes, I did feel guilty but it wasn't my fault. The sauce was so out of this world! just out of the owen. you look, you look, you look. but you can't take your eyes off'em. Easy. Take organic potatoes. Scrub them well, under running water. Cut them in chunks, like the ones on the photo. In a bowl, mix fresh rosemary (cut in small pieces), fresh thyme, salt, freshly ground pepper, paprika, lotsa olive oil (virgin please!) 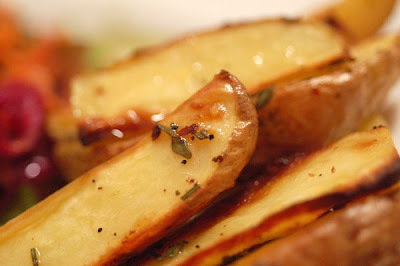 Put baking paper on the tray, dip the potatoes in the mixture, put on the sheet. Heat the oven. 200 celcius (400 fahrenheit) is good enough. They need to be baked at least 30-35 min. Check after half hour. Then serve'em with fish, meat, burgers, veggies, salad, or eat as it is. Too good to be true. Too easy to be true.